I’ve done a bit of design work in the tabletop RPG industry, and like most gamers I’ve started and abandoned game designs over the years, but today marks only the second time I’ve designed a complete RPG and shared it with others. After enjoying my experience with RPG Geek’s 24-hour RPG design contest in 2012, during which I designed my first complete RPG, Eaten Away, I was intrigued when I heard about Game Chef 2013. I also hoped I wouldn’t get an idea for a game, because I didn’t think I’d be able to finish anything, but that’s not how ideas work, is it? Of course I got an idea I couldn’t ignore. 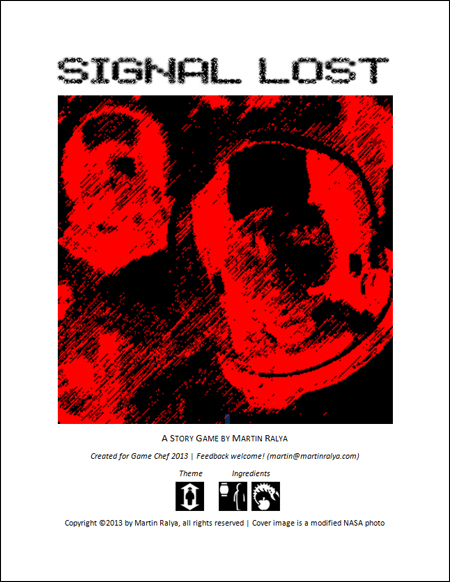 Signal Lost is a story game about exploring the Distant Star, a deep-space survey vessel that has gone dark, and facing an alien terror. Here’s a direct download link: Signal Lost RTF file.